A perhaps unique, and certainly uncommon compliment that can be attributed to CRAIG RICHEY’S score for WONDERFUL WORLD is its strong resemblance both the synopsis of the film and the poster. Merely glancing at the simplistic poster or taking in a written description of WONDERFUL WORLD’S plot sets up an array of expectations. 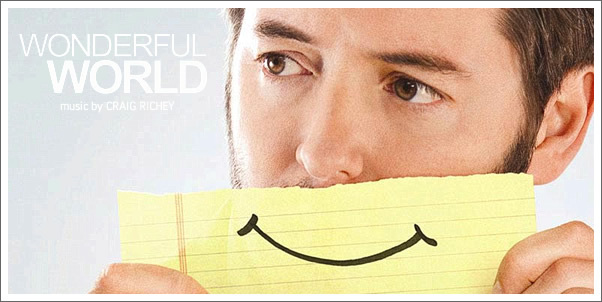 From the clean and understated title font and character image montage, to the curiously depressing sight of a man holding a paper smile to his face, WONDERFUL WORLD creates a strong sense of familiarity, albeit subconscious familiarity. The juxtaposition of the title with the clearly forlorn eyes that sit above the paper smile that seeks to fool you is a trait that can be instantly recognized as being a part of the score too. CRAIG RICHEY’S score is one of lies, in that behind the often happy facade lies an ocean of sadness, a sadness that lingers in the ear of the listener defying their initial reactions.